After two years of weekly protests in front of its store in Brighton, Israeli company Sodastream has closed the store. 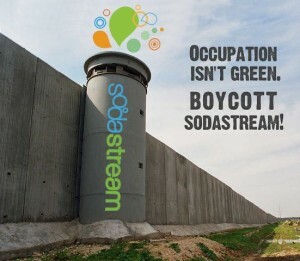 In addition, one of Britain’s biggest retailers has announced that it will stop carrying Sodastream, which is manufactured in an Israeli settlement built illegally on Palestinian territory. The company produces a product that appeals to environmentalists – a do-it-yourself soft drink making kit – which saves money, water and plastic bottles. But the Sodastream kits are produced in an Israeli settlement, which has made the company a target of boycott campaigners. The Ecostream store in Brighton, England, sold a type of recyclable bottle to go with the soda-making kit. The bottles are produced in Ma’ale Adumim, an illegally constructed Israeli settlement near Jerusalem. The store had been open for two years when it closed its doors this week – despite having reported a profit for each of the two years it was open. The company did not mention the protest campaign against it as a reason for closing the Brighton shop. The Boycott, Divestment and Sanctions movement aims to pressure Israel to end its occupation of Palestinian land through economic means. Activists are modeling the campaign off the anti-apartheid campaign of the 1970s and 80s, which used Boycott, Divestment and Sanctions to pressure the South African regime to end its apartheid policy which discriminated against non-white South Africans. Sodastream came under fire earlier this year when Scarlet Johannsen was selected as a spokesperson for the company. She was pressured by activists to end her role as spokesperson, but instead she defended the company, saying it “provides jobs” to Palestinians. The anti-hunger organization Oxfam decided to remove her as a global ambassador because of what they saw as the hypocrisy of trying to advocate for human rights while at the same time having a spokesperson who defended these violations by representing a company built on stolen land and benefiting from discriminatory policies. Some of the Israeli policies that the Boycott, Divestment and Sanctions movement activists include: separate roads that discriminate against Palestinians, ‘absentee laws’ that allow the Israeli government to take over Palestinian property if the owner is absent for six months or more, laws that create ‘security zones’ that strip Palestinian owners of their property, and laws that prevent married couples of different ethnicities to live together. 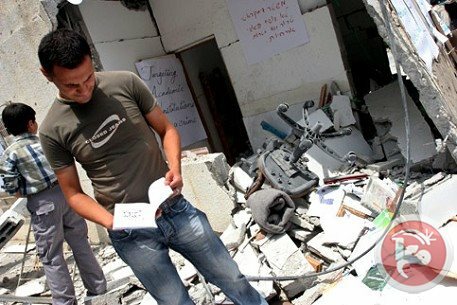 These are examples of over fifty discriminatory laws identified by activists as discriminatory against Palestinians. In addition, as an Occupying Power since 1967, Israel is under obligations according to the Fourth Geneva Convention which include not transferring civilians into the Occupied territory. This and other obligations have been violated by Israel on a near-daily basis since Israel’s takeover of the West Bank, Gaza and Jerusalem in 1967. It started out like every other university's response. Or, at least, that's how it seemed at the time. In the wake of the ASA decision, however, college presidents and university administrators across the United States publicly, officially, and completely on the record, went totally berserk. First, there was the severing of institutional ties to the ASA, prominently led by Brandeis among other universities. The icing on the cake was the attempt by local legislators in New York, Maryland, and Illinois to pass bills that would suspend taxpayer funds for public universities if their faculty or departments endorsed the ASA boycott vote. All of the bills ultimately failed. Of course, administrative meddling in faculty members' professional activity has an obvious dampening effect on the very academic freedom to which these administrators were so noisily professing their fealty. We could perhaps overlook this rhetorical hypocrisy were it not for the companion attacks on taxpayer funding of public universities. Because, of course, this is the real issue: money. University presidents are less like professors and more like heads of corporations whose job is to keep the institution profitable and its endowment ever-growing. All those presidential statements of condemnation are, like those nasty legislative bills and Northeastern University's recent suspension of its Students for Justice in Palestine, an attempt to toe the Zionist party line when it comes to Israel and pre-emptively appease big donors. In the wake of the ASA decision, the same thing happened at my own institution, the University of Massachusetts Boston. Or, at least, that’s how it seemed at the time. 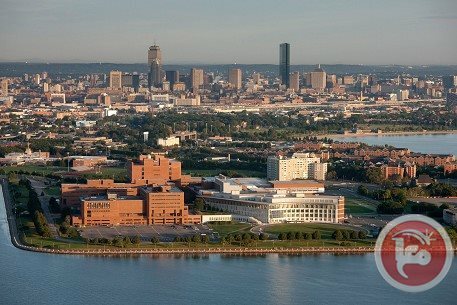 In late January, without prior faculty consultation, our Chancellor, Keith Motley, released a public statement on the university's website proclaiming that, "as an institution," UMass Boston "strongly opposes the boycott of Israeli academic institutions announced by the American Studies Association." All of this was even more surprising given UMass Boston's generally progressive campus climate and its character as a public institution. Both seemed to militate against our administration taking any public position on academic boycott of Israel at all -- much less a condemnatory position that seemed to echo that of so many other mainstream campus administrator responses. In some ways, this proclamation echoed that of other institutions by condemning the ASA resolution in the name of academic freedom, and being issued by a university administrator who purported to speak for the entire campus in his role as an administrator. In other ways, however, it was different. Chancellor Motley acknowledged that not everyone on campus may agree with his statement. He explicitly upheld the right of campus community members to voice and advocate for different points of view. And yet, it was difficult not to read this statement from within the context of the avalanche of condemnations that had preceded it. Hence, many faculty and staff wrote to the Chancellor to express our concerns regarding his statement. Some of us did so collectively, in a single letter. Others did so individually. All of us, however, were uncomfortable with his speaking for the entire institution (even if his statement did acknowledge the existence of disagreement), and many emphasized the outrageous lack of academic freedom for Palestinians that is all too often overlooked in the discussion surrounding academic boycott of Israel. Most remarkably of all, the Chancellor agreed that the issue of academic boycott of Israel was what we often all-too blithely call a "teaching moment." As such, he proposed that the Provost host a panel discussion for the UMass Boston community to address the issue of the ASA resolution, the "facts and beliefs behind it," as well as "the whole thorny question of appropriate responses to it, whether by individuals or by institutions." In other words, whereas campus administrators across the country had uttered various self-serving pieties about the importance of academic freedom, on our campus, these proved not to be empty words. We held precisely such a panel discussion at the end of April. Four senior faculty members of varying perspectives gave their views with regard to the usefulness, importance, and legitimacy of academic boycott of Israel. While everyone agreed that Israeli policies violate human rights and are counterproductive, there was disagreement as to whether a boycott was the right move strategically. The event was moderated by a professor of Dispute Resolution, and attended by a representative group of faculty, students, and staff, most of whom stayed for the entire 2-hour long event. We even broke into small groups to discuss the panelists' remarks, and came back together for questions for the panelists and a larger discussion about how to continue this dialogue on our campus into the future. The event was a resounding success. I heard for many days afterwards from members of the campus community about how grateful they were to have had an opportunity to learn more about the boycott and hear what faculty members had to say about the matter. People from different perspectives on the matter shared a conversation with one another that likely would not have taken place under any other circumstance. And the result was not rancor, hostility, or further polarization. In fact, quite the opposite -- those from different political points of view gained a greater understanding of each others' positions rather than demonizing one another, as so easily happens when we engage only from afar. Enthusiasm for continued conversations about solidarity politics and Israel/Palestine was generated. And our campus' commitment to shared values of social justice, human rights, and academic freedom was re-affirmed. These unprecedented events at UMass Boston make clear that the ASA resolution can open spaces for genuine debate, generate informed exchange, and help shift perspectives. Would that more university administrators had the courage to see the boycott resolution as a teaching moment, an opportunity for the exercise of real academic freedom. Pushing a political agenda that challenges any mainstream consensus always faces the criticism of being "divisive." The standard left response to this attack is, of course, that this is precisely the point. Politics is divisive. Unity all too often masks and even perpetuates hierarchy, inequality, and injustice in the name of harmony or "peace." What the events at UMass Boston reveal is that "divisiveness" can also be productive of camaraderie, learning, and intellectual and political exchange. "Divisiveness" can serve to move people and events closer to one another and to justice. And "free speech" need not be a saccharine veneer covering the suppression of "divisive," critical, or left-oriented political agendas, but can in fact be a robust celebration of difference in unity, disagreement in a united front to end injustice.